Every month a delectable new cheese will be featured and on special at all locations. Experience the taste of artisan cheese. Click the button below to find The Cheese Lady location nearest you. Browse The Cheese Lady's unique selection of crackers, condiments, fruits, and more. 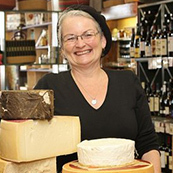 The Cheese Lady offers a wide variety of wines to compliment an array of cheeses. Cheese gives me much pleasure. Part of that pleasure comes from knowing a little more about it every day. And part of the pleasure comes from providing people with a place to buy cheeses that will take them back to another place, another time.